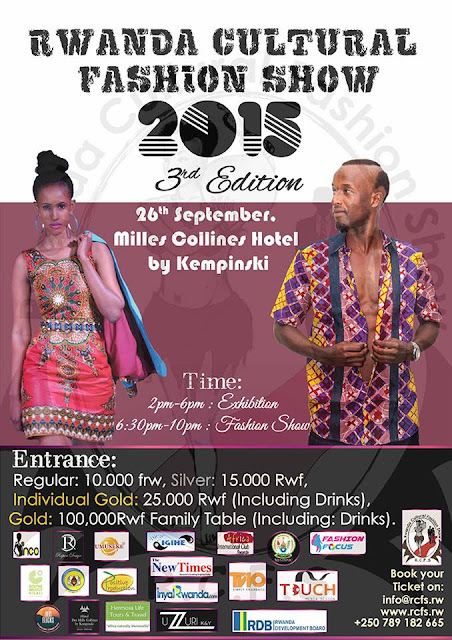 Rwanda Cultural Fashion Show has been scheduled for September 26 at Des Millie Collin Hotel, Kigali. According to the Organizer, Celestine Ntawirema, international designers from Kenya, Ghana and South Africa will grace the event, along with local designers and the event will attract the crème-de-la-crème in the fashion industry. Some of the local designers who will participate are Uzuri, Christine's Creative Collections Ltd- (CCC), Rupari Design, D-Green Fashion House, Isano Design, Zahabu Fashion Design, Agasozi Art Centre. "The interaction of local and international fashion experts will create new and better fashion ideas," Ntawirema explains. "It is also an avenue to provide networking opportunities for designers and models," he adds. The show will also feature art exhibitions, live painting as well as an expo of designers' products. This, Ntawirema says, is not only aimed at creating business opportunities but also exporting Rwandan fashion and culture. The Rwanda Cultural Fashion Show started three years ago and has grown into one of the leading fashion events in the country.